Why in the world would the unflappable Mitt Romney allow himself to be provoked by a has-been rival into making a remark that only serves to remind voters that, at a time of mounting concern about gaping income inequality, he is a member of the one-hundredth of one percent? Well, maybe because...he's not so unflappable. I realize some readers are having a hard time accepting the fact that Mitt Romney is not the robot that conventional wisdom has decided he is. But in the span of 10 days, we've had him acting exceedingly thin-skinned in an interview with Bret Baier, and now this. Go back to the tape to see how the now-notorious $10,000 wager at the ABC debate in Des Moines on Saturday night came about: Rick Perry was again challenging Romney on his past declarations that Massachusetts' health care law was a model for the nation, and this immediately riled Romney up. No, he didn't get angry; but he let Perry get to him yet again, just as he had in their immigration exchange in Las Vegas, and in a moment of pique, he made his fateful high-roller offer. This disposition flows naturally from the disconnect between the Mitt Romney presidential campaign and Mitt Romney the man. Romney is running a campaign as “Mitt Romney,” an Obamacare-hating, tough-on-immigration, climate-science skeptic. Now, obviously, all the Republican candidates are running on a similar theme. Most of them actually believe it. But Romney is acutely aware of the disconnect between the character of “Mitt Romney” and the actor portraying him. Because Romney is too intelligent to fall for his own ruse, his campaign is one large Potemkin facade, designed to shield him from the interjection of reality...He has a precise, calculating mind. To his credit, he seems all too aware of his own lies and requires constant protection from them. The carefully paced, tightly controlled public presentation Romney favors is a thing of the past. He now finds himself in a situation where he’s far less comfortable: Caught in the current of a fast-moving, pressure-packed, unpredictable campaign. Should he lose his temper, bark at a rival, upbraid a reporter, or explode at a heckler, the event could take on a life of its own. It takes a cool head to survive a hot campaign. 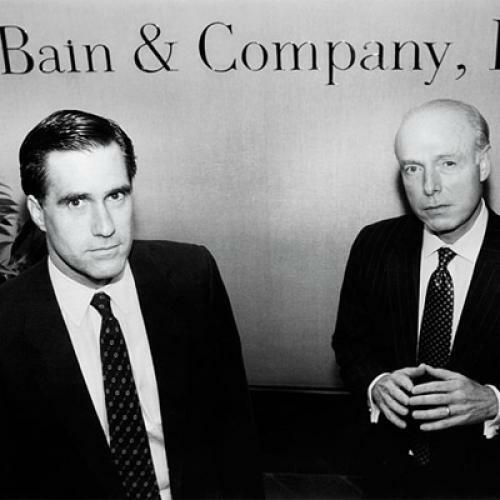 And for all his other assets, composure is something Romney doesn’t always possess when the rapids get rough. Maybe now, as the $10,000 bet enters the political lexicon alongside "oops" (and maybe even Romney pere's "brainwashed" line), the reality behind this observation will finally sink in.